Glei’s Orchards and Green­houses acquired new apple sorting machines. Regan Meyer | Col­legian. 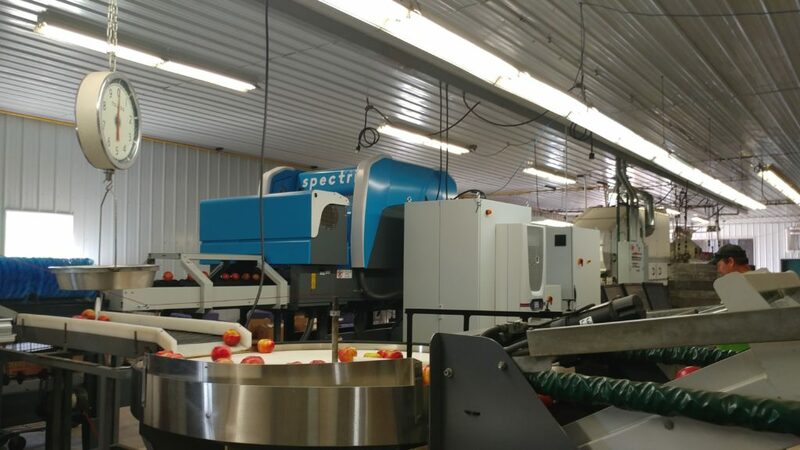 Three miles east of Hillsdale College, Glei’s Orchards and Green­houses is uti­lizing the newest tech­nology in apple sorting. The new tech­nology is rev­o­lu­tion­izing the industry with its ability to detect external and internal defects in the produce.The Spectrim does external defect sorting, taking hun­dreds of pic­tures of one indi­vidual apple. Glei’s new machines, the Spectrim and the Inspectra2, are stream­lining Glei’s apple pro­duction process. The Inspectra2 is the only machines of its kind in use outside of New Zealand. Glei’s acquired the machines from Compac, a crop-sorting company based out of New Zealand. Seely teaches the machine to detect many dif­ferent kinds of defects. The Inspectra2 detects internal browning in the apples. Apples with the grades of extra fancy and fancy are sold to dis­trib­utors, while Glei’s finds other uses for those with defects. The Hillsdale and Cold­water stores sell the utility apples, the grade lower than extra fancy and fancy, while the rest of the produce is ground into cider. Before acquiring the Compac tech­nology, Seely and his crew inspected each apple by hand. They could only remove the fruit with external defects, however, as there was no way to see inside the apples. Glei’s began looking into dif­ferent apple graders from com­panies ulti­mately set­tling on one from Compac. While Compac rep­re­sen­ta­tives out of Sparta, MI helped Glei’s with the planning, the machines were custom built in and then shipped from New Zealand. While the machines allow for faster pro­duction, no Glei’s employee was let go when the new machines were imple­mented. The employees say they love the new machine. Super­visor Kendra Webb has been at Glei’s for three seasons. Grader Linda Johansen says the new machine helps her back and makes it easier to bag the produce. Glei’s can now compete with other top apple pro­ducers. Seely explained Wash­ington is the biggest apple pro­ducer in the United States. Michigan, Ohio, New York, and Penn­syl­vania com­bined don’t have as many apples as Wash­ington.